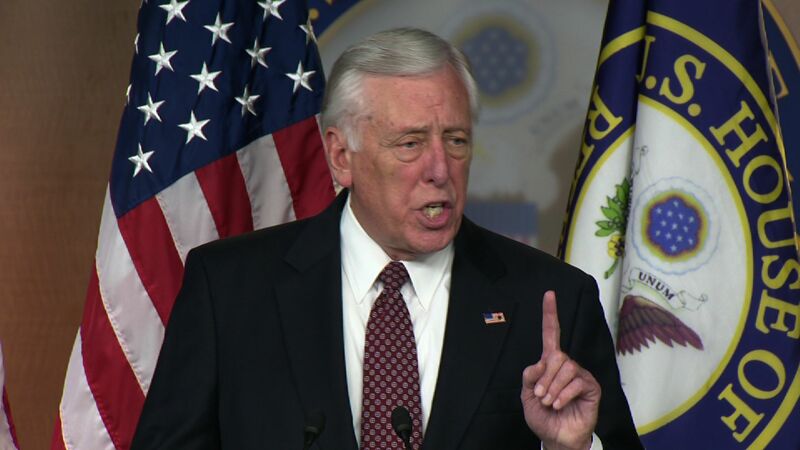 Maryland Rep. Steny Hoyer, the second highest-ranking Democrat in the House of Representatives, encouraged a progressive congressional candidate to end his campaign, according to The Intercept. Levi Tilleman, a former Energy Department official, is running as a Democrat to unseat Rep. Mike Coffman, a vulnerable GOP congressman from Colorado. But according to a recording published by The Intercept, Hoyer told Tilleman that the Democratic Congressional Campaign Committee (DCCC) preferred another candidate – lawyer Jason Crow -- in the primary. "Yeah, I'm for Crow," Hoyer told Tilleman, according to the website. "I am for Crow because a judgment was made very early on. I didn't know Crow. I didn't participate in the decision. But a decision was made early on by the Colorado delegation." When Tilleman pushed back, Hoyer defended the party's decision to support what they believe is the more electable candidate in a primary. "You keep saying I would like you to get out of the race, and of course that's correct," Hoyer told Tilleman. Hoyer's office said that he is working to identify electable Democrats. "Whip Hoyer is committed to taking back the House, and that involves working with local leaders to identify and support the strongest candidate for that district," Hoyer spokeswoman Katie Grant told CBS News. It is not unusual for party leaders to try and help candidates in primaries that they view as the most electable option. On Thursday, House Minority Leader Nancy Pelosi, defended Hoyer during her weekly press conference. "In terms of candidates and campaigns, I don't see anything inappropriate in what Mr. Hoyer was engaged in a conversation about the realities of life in a race as to who can win in the general election," Pelosi said. In November, Crow was moved to the DCCC's "Red to Blue" list, which is not an official endorsement. However, the move did irritate Morgan Carroll, the state party chair. "The DCCC verbally said they would be neutral and in practice just endorsed one of the candidates in CD6," Carroll wrote on Facebook. Tilleman also criticized the DCCC, saying that their strategy was counterproductive. "They squash progressive candidates. They destroy the diversity of ideas in their caucus. They keep ideas like 'Medicare for All,' free community college, or impeaching Donald Trump from having a significant role in the national conversation," he told The Intercept. "The issues that resonate most with voters are not the issues that the DCCC is telling candidates to focus on."